As a producer it is extremely important you understand how to make amazing hi hats for your beats.Hi hats are one of the main elements that determine the energy and feel of your track. This is very important for determining the mood of your track and transitioning into new parts of a beat. A great example of this is how the hi-hat changes between a verse and a hook. In your verse you might have your hi hat hitting on eighth notes. 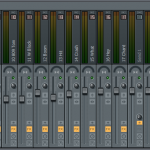 Then having the hook of your tracks have a continuous running hi hat on every sixteenth note. Switching the high hat from eighth notes to sixteenth notes can add a lot of energy to the hook. This can put focus on your hooks and add some dynamics to your beat. Many people seem to think you can only have one hi hat on your drum sequences. Meaning, one hi hat sample. But the truth is you can have multiple hi hats samples to create a more dynamic hi hat sequence. For example, one hi hat might be running straight eighth notes while another hi hat is doing a triplet sequence. This can add some variation to your standard hi hat sequence. Also, with hi hats you can always stack samples to get a more unique sounding hi hat tone. This is something we talk about a lot with drum samples. The hi hat is no different. Stacking your hi hat samples can also give you a more unique tone than stock hi hat sounds. Don’t let your beat have a dull hi hat sequence. You want your hi hat to give your beat energy. This means you don’t set your hi hat to run on 16th notes or eighth notes for the entire track. Mix up your hi hat sequences as you transition through parts. Also remember that hi hats don’t only have to have straight running hi hat patterns. Hi hat sequences can use complex patterns just like any other element of your beat. A great example of this is the use of the hi hat in trap beats. 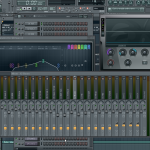 Trap beats will often have complex hi-hat runs that add a serious amount of energy to the track. They often start out with a basic straight run and transition into more complex patterns such as triplets or sped up runs. 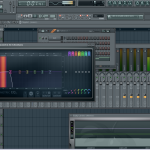 When creating hi hats in FL Studio I like to start in the Step Sequencer. This is the easiest place to paint out a hi hat pattern and get the basic sequence created. A quick way to get your hi hat sequence laid out is right clicking on your hi hat sample in the step sequencer and then clicking on fill each (2, 4, or 8 steps). This will lay out a straight hi hat run based on the steps you choose. 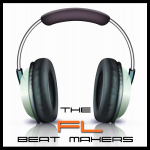 For basic hi hat sequences the FL Studio step sequencer will usually get the job done. For more complex hit hat sequences I will open up my hi hat pattern in the piano roll. To do this right click your hi hat sample and choose send to piano roll. This will open up what you have sequenced for your hi hat in the step sequencer. Using your pencil tool you can left click to paint notes. Also you can use the selection tool to select notes and copy and paste. This can really speed up your work flow if you want to repeat a certain part of your pattern. One important setting is the snap. This can be use to change the size of the grid. This is great for painting in smaller notes to the desired length. Quick tip: The paint brush tool is similar to the pencil tool except it allows you to paint multiple notes at a time. It is great for painting out a large number of notes quickly. The next FL Studio Tool I like to use for hi hats is the quick chop tool. Once you have notes selected you can chop them to the desired length. I like to use this one when I have larger notes painted out and want to chop a group of them into smaller notes. The quick chop tool is great for for that. 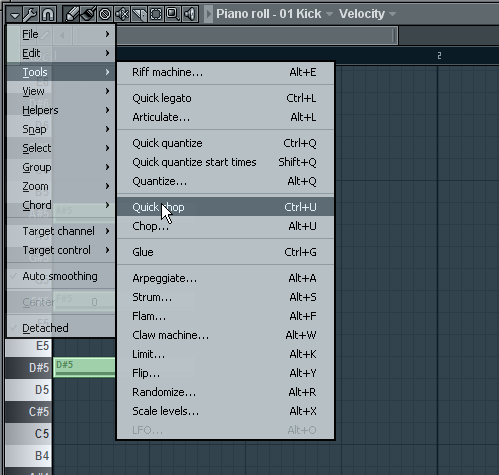 The quick chop tool can be accessed from the piano roll tools menu or by clicking Ctrl U on the keyboard. One of the last ways you can enhance your hi hat sequences is adding some humanization elements. This could be varying the velocity of you hi hat hits, not painting them exactly to the grid etc. Some producers actually prefer to play their hi hat sequences manually using a midi keyboard. This is a great way to capture the velocity and the human element of timing for your hi hat. There is no better way to humanize your hi hat parts than manually playing them. The key is to use your hi hat to add energy to the track. Your hi hat can really change the feel of the beat so use this to your advantage. A lot of people focus on hard hitting 808 drum samples or great sounding snares and forget how important an interesting hi hat part is for a beat.